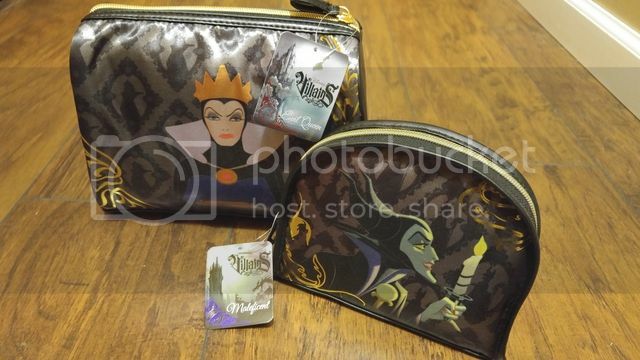 Get your evil on with these new LONDON SOHO NEW YORK Disney Villains Makeup Bags that launched at Walgreens This daring Disney collection of cosmetic bags features the original Villains: Maleficent, Snow White’s Evil Queen and Ursula. Available exclusively at Walgreens, the Villains collection contains six new cosmetic bags that will make being bad look so stylish. This collection, including a weekender, organizer, train case and round top purse kit is inspired by the favorite foes of Disney’s classic tales. Known for versatile, long-lasting and on-trend cosmetic bags, LONDON SOHO NEW YORK® blends these infamously wicked characters and functional design in this latest collection to let out your dark side in style. Prices range from $7.99 to $11.99! These bags and beautiful and are perfect for everyday use, travel, for kids to use at school, etc. Even the inside is a work of art! The lining of Maleficent features a beautiful fabric with red and purple dragons and flames. The Evil Queen bag features a red fabric liner that had heart daggers and crowns on the inside. They are beautiful inside and out! Make sure you head to Walgreens and Walgreens.com to pick up some of these bags for Christmas! They would even be cute as the wrapping paper! Place a small gift inside one of the bags, the classic movie or the new one, no need to wrap it! Let the bag speak for itself.